Today is National Doodle Day​. National Doodle Day is a doodle-tastic annual fundraising event organised by Epilepsy Action. Over 1,600 celebrities have taken part in National Doodle Day since it began fourteen years ago with each artwork auctioned on Ebay to raise money for this fantastic cause. We thought you’d like to do-a-doodle-too (did someone hear a cockerel?) by introducing a very special FREE competition where the winners can get their hands on some very special prizes for Whilton Locks Garden Village​ Christmas Winter Wonderland Family Fun Weekend on 25/26th November. This very special Family Fun Weekend is new for 2017 and is to welcome Santa and Officially open the Ice Rink. The weekend includes Free Face painting, Free Frosty our huge inflatable bouncy snowman, free cuddle days and so much more. Full details to be announced shortly. For your doodles – We have FIVE top prizes including Free Family Skating Tickets (on the weekend of 25/26th November) and VIP entry to the weekend and the winning artworks will feature on some exclusive WLGV marketing for this years Ice Rink for our Family Fun Weekend! Your doodles will be famous! 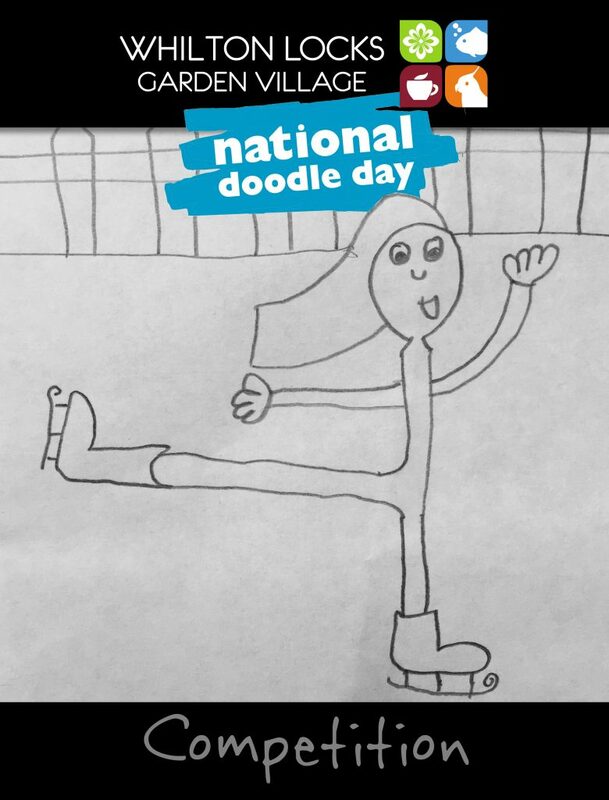 IMPORTANT: Your doodle must be someone – or something – skating on our Ice Rink. Use your imagination with your doodles and outline and full colour are both allowed. Entries to be received before 9am next Friday (29th September) – You’d better get your skates on! 1. All entries must be uploaded on our Facebook Page before 9am Friday 29th September, 2017. You can hand them in, in store before the deadline and we’ll post them on the page. 2. All posts must include the artists first name (you may post it on behalf of someone else, your children for instance) and it must include the artists age – we would like to know if you are 9 or 99! 3. It must be the artists original work. For prize winners we may ask to see the originals. 4. You can enter as many times as you like. 5. Winners to be decided by a combination of Facebook likes (on the post – so get your friends and family to like and share your doodle) with the WLGV team judging the final winners via a shortlist. Judges note: We aren’t looking for the very best artists, we are looking for imagination and fun with your original doodles. Prize winners to be contacted via Facebook PM. Winners contacted week commencing 2nd October.